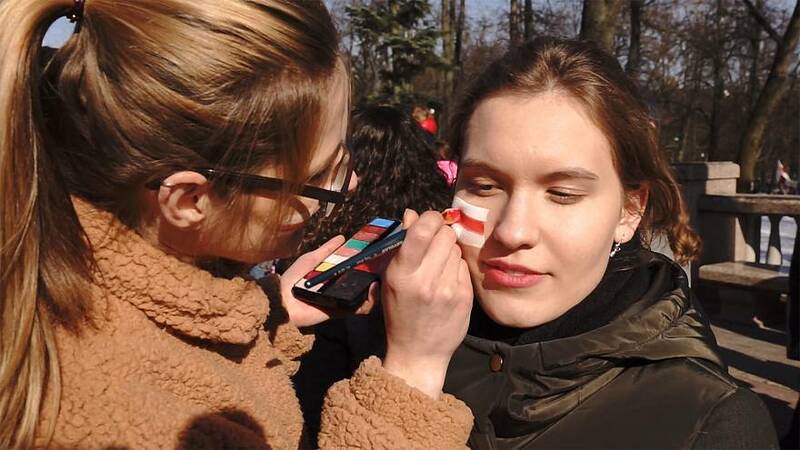 On March 25th, thousands of people gathered in Minsk, the capital of Belarus, to celebrate the centenary of the so-called BNR; the proclamation of the first Belarusian People's Republic in 1918, which was swept away a few months later by the Bolsheviks. It's a commemoration not officially recognised by the regime of Belarusian President Alexander Loukashenko. The official national day is on the 3rd of July, marking Minsk's liberation from Hitler's Nazi forces in 1944. But for many, March the 25th, so-called 'freedom day' is the true symbol of Belarussian identity. Just like the former white-red-white flag, replaced by Lukashenko in 1995. The banner, banned for years, is now allowed to be flown on this day, within the perimeter of the celebrations. Thousands of passionate citizens want to see change. "I hope it will be the start of maybe our new freedom. Because Belarusians are not free in Belarus." The event has attracted thousands of people today on the square. But for others who tried to rally elsewhere this morning in another part of town, things did not run so smoothly. An hour before the start of the authorized celebrations, another event, banned by the authorities, was short-lived. A few dozen opponents of the regime and ordinary citizens had gathered in another part of the city to march through the centre to the site of celebrations. Our reporter Valérie Gauriat was there. "People have been trying to stage a rally before the official BNR celebrations, but they are being arrested, one after the other". Dozens of people were arrested in Minsk and across the country. A woman from the crowd told us,"Today is a celebration! Why arrest people! No! We have a real dictatorship, we have neither freedom of expression nor decent work for people!" It's discontent which the famous opponent, and ex-presidential candidate in 2010, Mikalai Statkevich, wants to answer. We had met him a few days earlier with his wife Maryna at their house. The couple had not left their home for several days, to avoid a possible arrest before the March 25th events. They are under constant surveillance. They have the radio on constantly. "They have a listening system! We make noise so that they can hear us less! ", Maryna told us. Her husband was arrested during a severe crackdown on massive protests against Lukashenko's re-election in 2010. His release, along with several other political prisoners in 2015, led to the lifting of most of the European sanctions against Belarus. But the repression has not stopped according to the opponent, who says he's spent a total of 8 years of his life in prison. "This is not a free country. People have no influence on power. There still are political prisoners, and they are tortured. This country suffocates people, it's hard to breathe here. Fear reigns here all the time. If nobody talks about freedom in the country, if no one fights for it, then people forget that freedom exists. The society is disintegrating, and the country becomes an easy prey for any outside force. Now Lukashenko is supported by Putin, and Putin is much more popular than Lukashenko in Belarus. This makes the potential annexation of Belarus very easy and attractive for Putin. We want a normal future for our country so we will continue to go out on the streets"
Our interview is suddenly interrupted. Mikalai's phone began to ring. "It's Nieklaiev Sivchik and Viniarsky is it?" The phone keeps ringing. Three of the main opponents in Belarus have just been arrested. "yes we are in our house, we're at home... We will try ... at home there is Euronews, so I think they won't do anything to us"
But Statkevich was arrested 4 days later in front of his home, as he was attempting to join the banned rally and march, before the BNR celebrations. Most of the people who were arrested that day were released the same evening. The muzzling of the protest was more muffled than at the same period last year. Thousands of simple citizens had joined in opposition protests for several weeks, protesting a decree imposing a tax on people working less than 6 months a year, the so-called "parasite tax". Ordinary citizens, activists, journalists...hundreds of protestors were arrested. The decree was abolished by the government early this year, but many feel vulnerable after being targeted. We have an appointment at the premises of the only independent union in the country. Here, support and legal advice are offered to people going through hardship. "I was arrested and put in a cell without light, without ventilation, without explanations, without a lawyer, without the right to inform my relatives. __I received a maximum fine of 350 euros, which weighed heavily on my family budget. And with an opponent label, it has become even more difficult to find work. " Like many in Belarus, both men work abroad to support themselves. With the crisis, incomes have plummeted and jobs are scarce. A new decree being written raises new concerns: this time it could require the unemployed to pay their social contributions in full. When people everywhere live in semi-poverty, they do not think about global things, they only think about their own survival. This is the difference between a democracy and an authoritarian regime." But the union has problems. The premises are under sequestration and hundreds of the union members are under investigation. A few days after our meeting, Dmitry was also arrested at the March 25th unauthorised gathering. The space for protest remains more than limited in Belarus, where the KGB, set in this building, still exists under this name. Free speech, particularly in the media is under tight control. But the authoritarian regime of Alexander Lukashenko seems to want to loosen its grip. Since the annexation of Crimea by Russia, of which Belarus depends economically, Minsk has more reason than ever to try to please the European Union. But the regime must improve its record on freedoms and human rights chapters admits the Minister of Foreign Affairs. Changes are in sight. But according to Vladimir Makei, Moscow must be handled with care. "We can not go to bed in the Soviet Union and wake up in a totally European democratic state. But that doesn't mean that we don't want to learn. But we would like to look at this situation in a greater context. Because today we are thinking about a possible change of our constitution. The situation in and around Belarus has changed, regarding for instance security issues... the Ukrainian crisis. That's why the authorities of Belarus would like to move forward cautiously, in order to maintain stability in society "
But it's a slow pace which part of the country's youth is tired of. Ksenia often comes to busk in the Minsk subway just to make ends meet. The rest of the time, she is a teacher in a village located a hundred kilometres from the capital. We met her again when she got back from school. Her 200 euros monthly salary barely allows her to live. "The wood is costing me half of my salary." Another dent in her salary, the 3 official newspapers she is forced to buy every week. Propaganda, she says. "Every teacher must have them!" "Why, what are they about?" "About our policy, and about the state and the rules and everything, I don't know... But I don't really read them...But they are very good for the fire!" The hardest part, says Ksenia, is the ideological pressure at school. "Everybody is afraid of something you know. Every teacher is afraid of the director, and the director is afraid of the higher people ... And this atmosphere ... it's not freedom. Maybe for an old person who has lived in the Soviet Union, it's very good. I do not know. But for young people, it's deadly. No progress, no independence, no future ... and a lot of police, everywhere police!" In a neighbouring village, we meet Somilee, a young Belarusian rapper. With the money earned abroad, he bought this house. He set up his recording studio there. The musician is one of those who last year had received the so-called letter of "happiness", summoning him to pay the parasite tax, targeting the unemployed. That inspired him a song, and in this video clip he burns the letter of the tax department and exclaims his thirst for freedom. "Somewhere in the middle of the continent there is a state where a musician is nobody, that's why I got a parasite fine - and I'm f ...... shocked, but I'm free like the wind and that's what I'll tell them. I live the way I want, and no other way"
"Living here in the countryside, I feel freer than if I were in town. For now, I have no problem with the authorities, I'm talking about everything I want, I say everything I think. But maybe I don't have any problems because they haven't listened to me yet ... "
In a country torn between its Soviet heritage and its thirst for modernity, two types of youths live side by side. We attend the annual regional forum of the Republican Youth Union of Belarus, or BRSM, the main youth organization of the country. A descendant of the Komsomol movement, the communist youth organization of the former USSR, it is financed by the state. Artsiom Mentsiuk commands the Brigade for Security and Order of the BRSM in Minsk, which sometimes lends a hand to the police. At his side, 21-year-old Yegor Makarevich. He heads the youth chamber at the Minsk City Council of Deputies. "We are young, we are the hope of the country We are faithful to our traditions and our ancestors. We are young, we are one family, it's you, it's me"
The commitment of these young people to the homeland and its government is unfaltering. Artsiom, "My most important value is the love for my homeland, patriotism, the patriotic sentiment. This is taught to us from childhood at school." Yegor shares this feeling, "The country has not lost the most important values: it has not lost the respect of its people, it pays special attention to every citizen, to every small town, to every village, and every road. That's why when you arrive in Belarus, you see a very clean country. A country which every day takes care of every citizen.That's why maybe we can feel that here there is a great stability, that everything is very clearcut." It's another type of national identity Pavel Belavus wants to promote. He opened this shop three years ago. Everything here bears the white, red, white colours of the old flag. "We have games in Belarusian, literature for children and adults in Belarusian, including that of our Nobel Prize winner Svetlana Aleksievich, there are souvenirs, gifts, music, we represent Belarus as it is and as it should be." The very existence of the store is a sign of an opening of the regime, says its founder. But this remains very limited. "Even if there are positive changes, and no one arrests us because of this shop, if I leave here and go somewhere with a white-red-white flag, the police will come to meet me, and I will definitely have problems. The power has two hands. One allows, the other forbids, one caresses and the other beats. And we are in between these two hands, trying to avoid falling in one hand or the other." Pavel was also the main organizer of the festivities scheduled for the 25th March. "We're going to get some flyers. Let's go!" On stage_,_ the next day, were several of the country's figures of the artistic scene. Not the least, members of the reknown yet underground Belarus Free Theatre, whose founders are exiled in London. Long banned, and harassed by the police for plays considered too sulfurous for the regime, they operate in what was once a garage, and live off donations from the public. On the 25th, a few of the Theatre's artists gave their first ever official public performance. "We see police cordons, there are arrests. But we got here and it's because people wanted it, not because we were allowed to do it. These are the people who wanted this event, and that's why we succeeded!" commented Pavel Belavus, amidst a sea of white and red banners. But reality quickly took over: We learned that after the concert, a few dozens of those who had lingered in the streets with their flags, were arrested by the police. But Pavel's enthusiasm had been shared widely, if only for a few hours. "Today, we have proved that nobody should be afraid of us and we are afraid of nothing. We together, we are the nation, we build it, we will live, we will live on this land, we will speak in Belarusian. White and red flags will be flown. Thank you, Long live Belarus!"